Keep in running smoothly with Renew Life Cleanses. Our comprehensive herbal programs promote regular elimination and support the body's natural detoxification process. Did you know that we come into contact with toxins every day – from the environment, our food, and even within our own digestive tract? While the body was built to process these toxins, today's world places increased stress on our elimination channels. 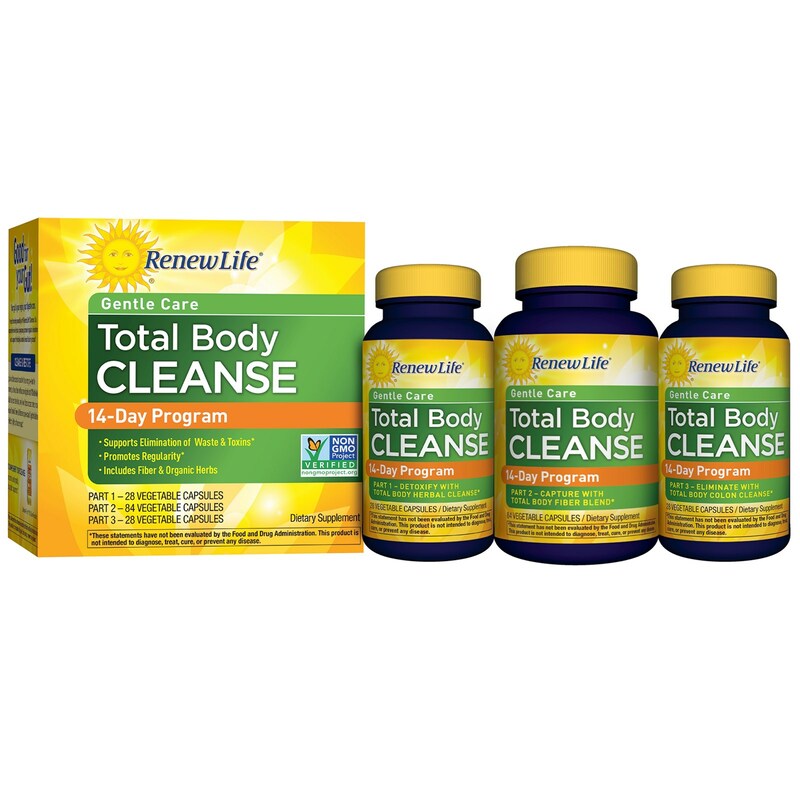 Renew Life Cleanses help re-establish digestive health so you feel better, lighter, and more energized. To Complement Your Cleanse - For optimal cleansing results, add a probiotic supplement. Ultimate Flora 15 Billion Probiotic. 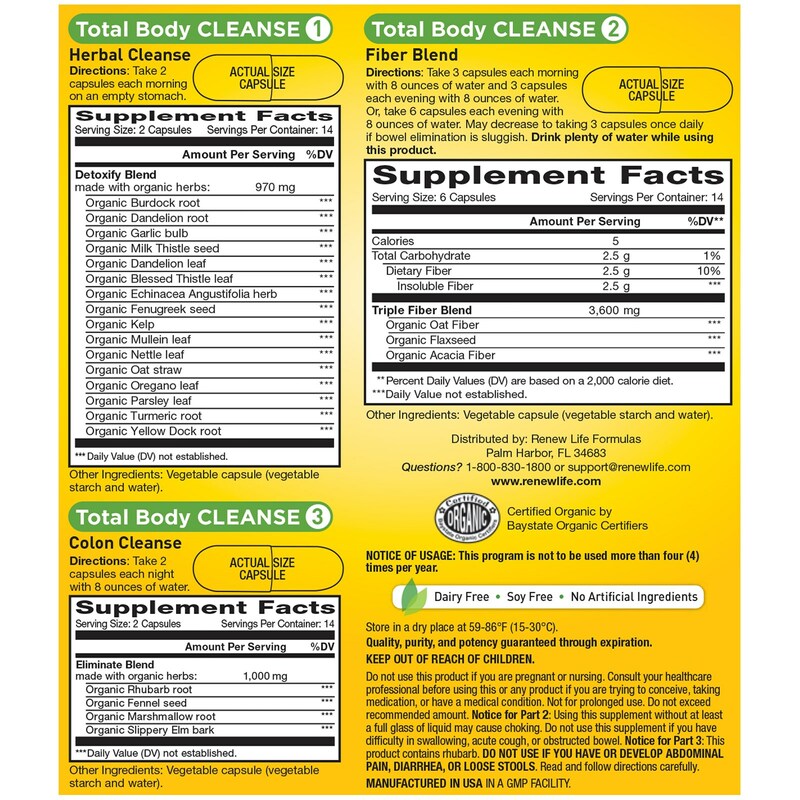 Total Body Cleanse 1 - Herbal Cleanse: Take 2 capsules each morning on an empty stomach. 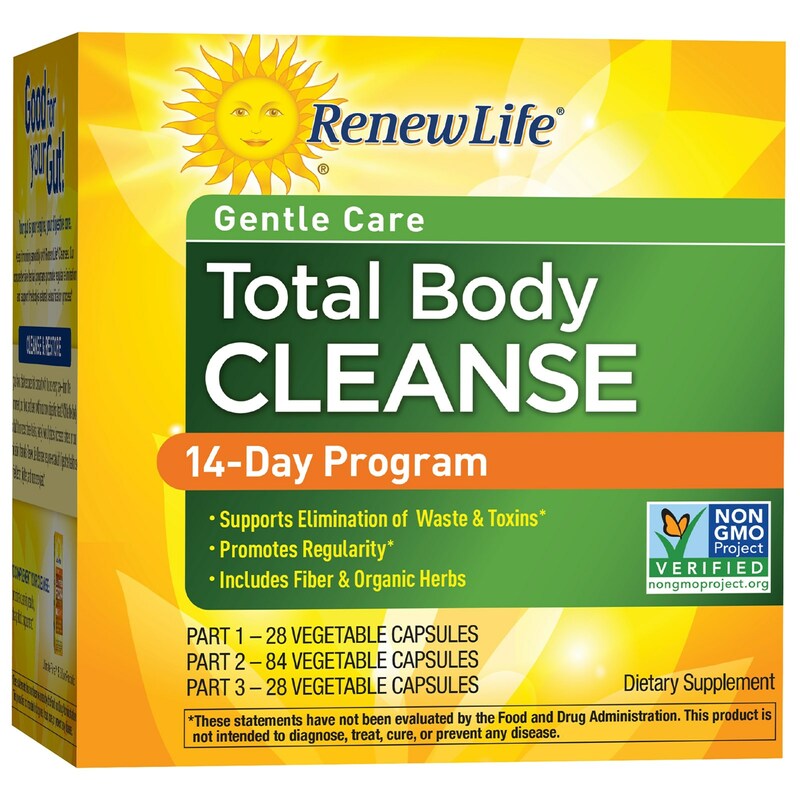 Total Body Cleanse 2 - Fiber Blend: Take 3 capsules each morning with 8 ounces of water and 3 capsules each evening with 8 ounces of water. Or, take 6 capsules each evening with 8 ounces of water. May decrease to taking 3 capsules once daily if bowel elimination is sluggish. Drink plenty of water while using this product. Total Body Cleanse 3 - Colon Cleanse: Take 2 capsules each night with 8 ounces of water. Tota1 Body Cleanse 1: Vegetable capsule (vegetable starch and water). Tota1 Body Cleanse 2: Vegetable capsule (vegetable starch and water). Tota1 Body Cleanse 3: Vegetable capsule (vegetable starch and water). Store in a dry place at 59°-86°F (15-30°C). Notice for Part 2: Using this supplement without at least a full glass of liquid may cause choking. Do not use this supplement if you have difficulty swallowing, acute cough, or obstructed bowel. Notice for Part 3: This product contains rhubarb. Do not use if you have or develop abdominal pain, diarrhea, or loose stools. Read and follow directions carefully. Tamper Evident: Do not use if either the outer neck band or inner seal on bottles is broken or missing.